Hash House Harrier virgins, that is. We had the opportunity to participate in our first ‘Hash’ this past Monday. 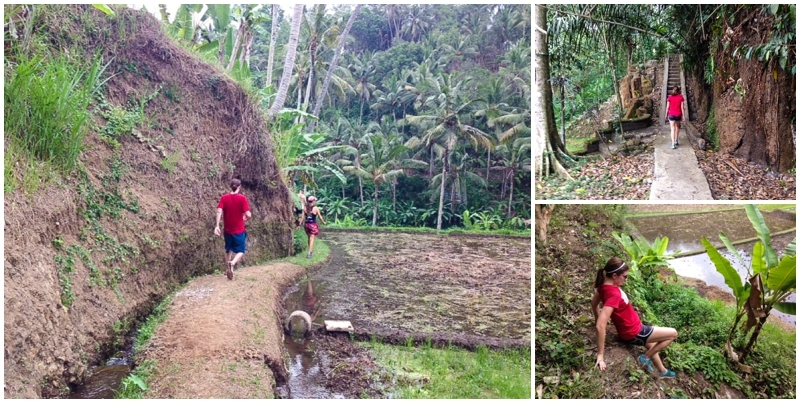 We joined the Bali Hash House Harriers for a 5k run/walk around the beautiful Ubud countryside. 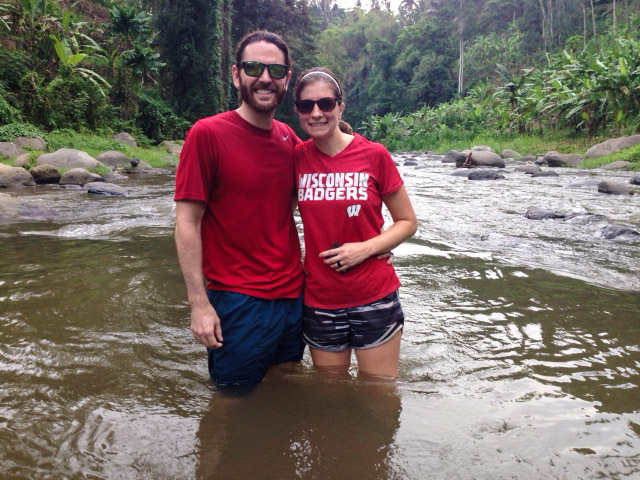 We trekked through rice terraces, over rickety bridges and eventually waded through a river up to our knees. Along the way, we passed plenty of locals who waived and said hello and a few even helped us get back on course when we hit a check back. At the finish we were rewarded with plenty of cold beer, which tasted great after sweating like crazy. It also happened to be someones birthday in the group, so he sponsored dinner for everyone who attended. 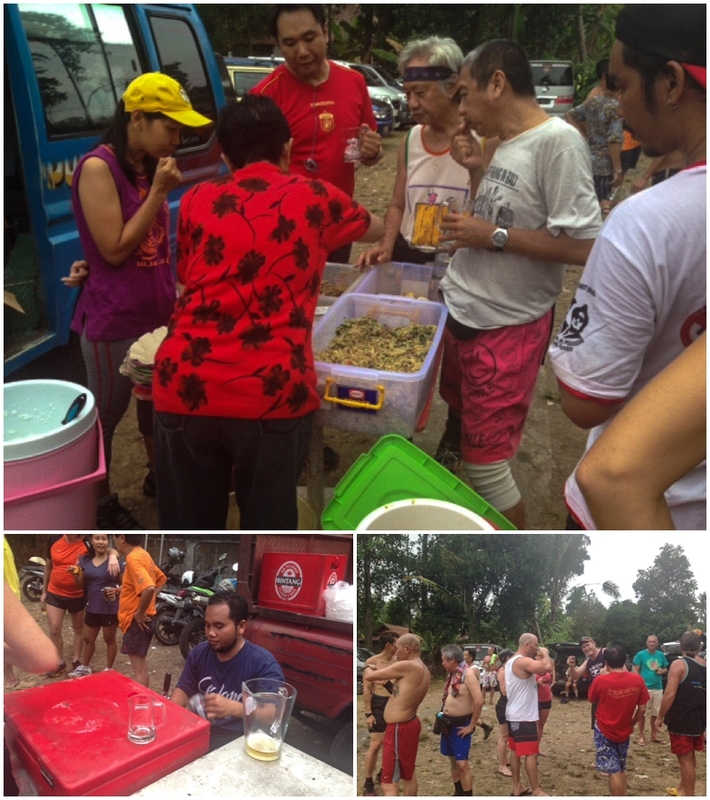 While standing in line for beer, we spoke to someone who drove up from Kuta (Southern Bali) and she mentioned 120 people participated! The Finish – Food and Beer! Once dinner was finished, everyone formed a circle and the MC took over. He informed members of future runs and events and then it was time to sing songs and slam beers! Members were called up and recognized for reaching milestone runs (100, 150, 200, etc). They received a t-shirt to commemorate their achievement and then slammed a beer. 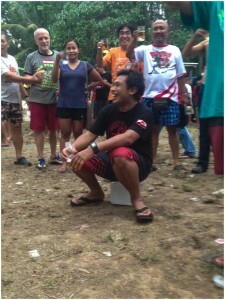 Other members were called, some told to sit on ice and slam a beer for their ‘sins.’ We still are not quite sure what these ‘sins’ were, but it was pretty amusing and everyone enjoyed watching. Finally, it was time for HHH virgins to be called up. The MC welcomed us to the group and informed us anytime someone asks what our Mother Hash is, we should proudly state, the Bali Hash House Harriers. He then asked us to put out our hands and poured beer into them for us to drink three times. 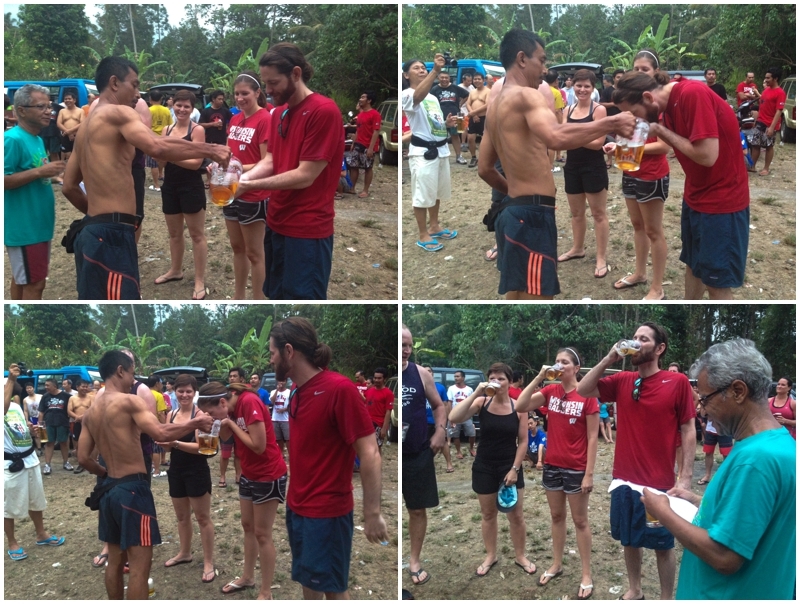 The final pour was so we could give ourselves a beer face wash or baptism? We were officially not virgins anymore! We went back to our place in the circle, only to be called up one more time. It turns out you must wear an official Hash t-shirt to every hash run and failure to do so makes you a sinner, and for that you must slam your beer. Again. 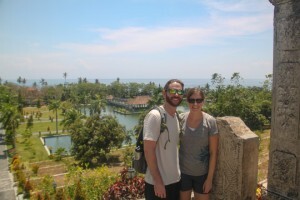 We had a great time and met some really fun people. We hope to participate in more hash runs as we continue to travel and eventually join a group in whatever city we end up living once we are back in the U.S.
Have your ever participated in a hash run? If so, where? A co-worker of mine only told me about the worldwide Hash Harrier Runs earlier this year when I was in Calgary. This is great info to know about Ubud’s chapter as I am actually planning a trip to Bali in late 2017. While I am not one for early morning exercise, reading up on Ubud already has me thinking about changing my lifestyle habits. I hope to be in peak shape by the time I get to Ubud. This is looks amazing! Hi Gloria- It seems the rules vary from group to group. 🙂 We definitely had a lot of fun and are hoping to find more opportunities all over the world! Haha Suz! I was thinking the same things about those guns…crazy. He must get those from lots of beers. What a cool activity! If there isn’t a HHH in Mpls., we should start one! Haha, yes 12 oz curls give you nice pipes! I did see a group in Minneapolis. We will definitely be joining!